Revelation 5:8-10 And when He had taken the book, the four living creatures and the twenty-four elders fell down before the Lamb, each one having harps and golden vials full of incense, which are the prayers of the saints. And they sang a new song, saying, You are worthy to take the book and to open its seals, for You were slain and have redeemed us to God by Your blood out of every kindred and tongue and people and nation. And You made us kings and priests to our God, and we will reign over the earth. From the beginning of Genesis (Genesis 4:4) to the end of the Bible (Revelation 22:3), there is a common theme -- the Lamb! 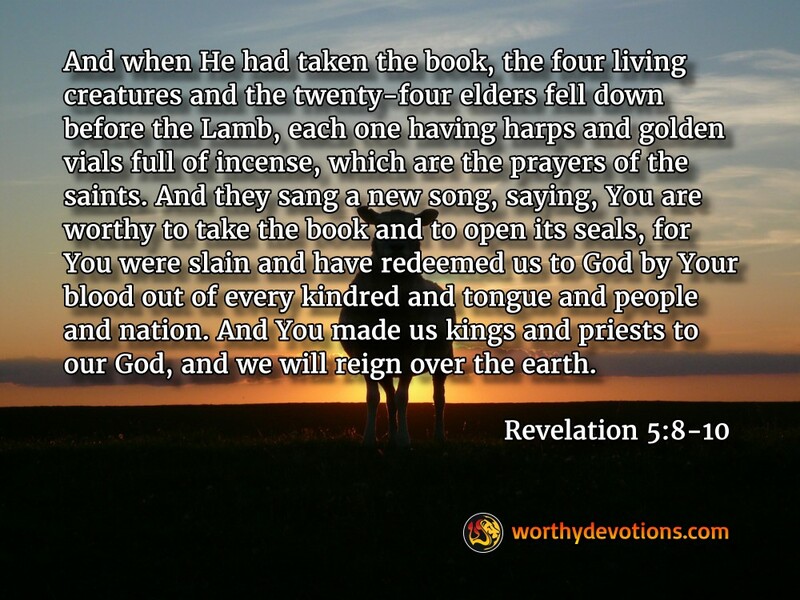 In Revelation 6 we read about the Lamb who sits in the midst of the throne -- worshiped by all of heaven because the Lamb was worthy to take the book and open the seals therein. The most harmless of creatures -- the object of sacrifice, becomes the authority of heaven. Isn't it interesting that the focal point of heaven is a Lamb? The world seeks power, fame and glory... The world's mentality is "survival of the fittest"... This is the way "nature works". And yet, how would a lamb fare in this competitive environment? It appears to be the weakest of all the animals, and yet, is the symbol of power and authority in the Kingdom of God! An amazing paradox. Authority in the Kingdom of God is marked and even defined by gentleness and sacrifice, in total opposition to the world's definition. When Yeshua died as the lamb of God -- He revealed the greatness of sacrifice. Likewise, Revelation 12:11 declares of the martyrs, "They conquered by the blood of the lamb and by the word of their testimony; for they loved not their lives even unto death." Several of Yeshua's paradoxical statements illustrate His Kingdom priorities. "He that loses His life for my sake -- shall find it". [Matthew 10:39]. "He that seeks to be greatest in the Kingdom shall become a servant to all". [Matthew 23:11]. Victory through death? Gain through total loss? Great stature through abject servanthood? Such are the beautiful ways of our Lord. Meditate on the Lamb, and you will discover the greatness in humility, the authority in harmlessness, the responsibility in servanthood, the victory in surrender, and the majesty in submission to the great God of creation. In His world, servants become kings; surrender becomes victory; death turns to resurrected life. Take hold of the paradox of the Lamb -- take hold of the Kingdom of Heaven! Hold the fort, Jesus is coming! Trust Him to Complete What He Started!